You already know about The Snuggie, the blanket with sleeves. If you’re wrestling with the recession, global warming, and ballooning health care costs, the last thing you want to deal with is cold arms. Which is why you have a regular blanket, from under which can be extended your lower arms, with minimal effort and heat loss. While you may gain a slight temperature advantage with The Snuggie, you have also purchased a nearly useless item and invited derision from your peers. You will also step on the bottom of it, trip, and die. I have an irrational hatred of The Snuggie. I’m sure I have all sorts of useless stuff in my house, like an iron and ironing board. And I buy lots of beer, which if I were to write down the pros and cons, it would probably come down on the side of useless, or worse. So far be it from me to make fun of you for buying a Snuggie and looking like a lazy monk or a hoodless Jawa. If you can’t figure out how to answer a phone or read a book without a sleeved blanket, I’ll leave you alone because your troubles are far greater than I’d imagined. However, if you buy a Snuggie for Dogs, all bets are off, and not least because of the infomercial. Both Snuggie ads start with terrible little rhyme-poems that sound like something a first-grade class came up with while learning phonemes. Both feature completely ineffectual people making simple, trivial tasks (like putting arms outside of blankets) nearly impossible. To top it off, the Snuggie for Dogs commercial says “added bonus” at the end, which George Carlin has noted is redundant. However, the Snuggie for Dogs is orders of magnitude more useless than The Snuggie for Humans for one reason: dogs already have a Snuggie. It’s called “fur.” If your dog needs a Snuggie because it’s too cold outside when it goes out to wee-wee and poo-poo, you’ve acquired the wrong dog for your climate (e.g. a Chihuahua in Alaska), or you’ve simply shaved the dog too close. If the Snuggie for Dogs were just useless, I would just take a deep breath, put one foot in front of the other, and let it go. I can’t do that, however, because this thing encourages people to dress up their dogs. Humans think it’s wonderful to put dogs in costumes, when in fact it is provably terrible for the self-esteem of the pet. Even if you have a doggie Stormtrooper outfit, people won’t think it’s badass and avoid the dog out of fear. They’ll think it’s really cute and funny that someone made a Stormtrooper outfit for a dog. The dog, in the meantime, loses all street cred and gets beaten up by other dogs. Take my dog, Harlee, for example. 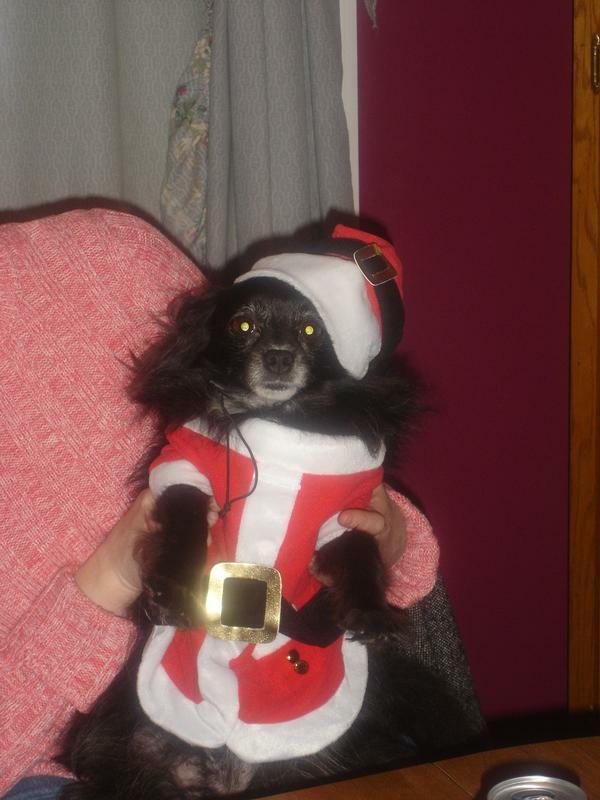 One Christmas we thought it would be fun to dress him in a Santa outfit. It was fun. For us. Because we had drunk heavily spiked eggnog and about 12 Old Styles each. I’ve asked nicely, I’ve pleaded my case, I’ve done everything but hack into the Snuggie for Dogs database and harangue all purchasers: avoid the Snuggie for Dogs. If you have already purchased one, send it to a Chihuahua rescue in Alaska. The dogs would (probably not) thank you for it. You should know, Matt, that I read this at least quarterly and can barely contain the laughter every time. Still gets my vote for Funniest TBTS Piece. Cheers.